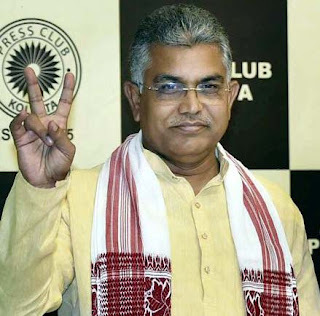 Dilip Ghosh also alleged that police officer Amitava Malik was killed in the gun battle in Darjeeling on Friday since he did not have adequate training to deal with combat situation in the hilly terrains. The Mamata Banerjee-led West Bengal government wants to eliminate Gorkha Janmukti Morcha (GJM) chief Bimal Gurung just as it had killed Maoist leader Kishenji, alleged Bengal BJP president Dilip Ghosh. He made the accusation a few hours after police said Gurung narrowly escaped their clutches on Friday when they raided an area about 20km from Darjeeling that triggered a gun battle in which a police officer was killed. Communist Party of India (Maoist) Politbureau member Koteshwara Rao alias Kishenji, who has been spearheading Maoist operations in the state’s Jangalmahal region was killed in an encounter in November 2011. It was alleged by Banerjee’s political opponents that her party Trinamool Congress earlier benefitted from the presence of Maoists when it launched Nandigram movement against the erstwhile Left Front government’s land acquisition policy in 2007-08. Ghosh’s remark triggered sharp reaction from Trinamool leaders, who described the statement as “sheer nonsense”. “Earlier, after the party used Kishenji, the state government killed him. After using Chhatradhar Mahato, the government has thrown him behind the bars. Now they are trying to eliminate Gurung as well,” Ghosh alleged while speaking to the media. Incidentally, Mahato, convenor of the Maoist-backed Police Santrash Birodhi Janasadharaner Committee, was arrested by police posing as journalists in September 2009 when CPI(M)-led Left Front government was in power. He was convicted by a court under Unlawful Activities Prevention Act (UAPA) and sentenced life imprisonment in May 2015. The GJM is an ally of the BJP-led NDA. BJP’s S S Ahluwalia won the Darjeeling parliamentary seat in 2014 Lok Sabha elections with the GJM support. On September 26, Union home minister Rajnath Singh appealed to Gurung to call off the indefinite bandh that crippled Darjeeling for more than 100 days. Prominent Trinamool Congress leader of north Bengal Gautam Deb, who is also the tourism minister, trashed Ghosh’s comments. “He is speaking nonsense. It is not the job of the government to shoot someone dead. I find it useless to respond to his remarks,” he said. The state government’s handling of the situation in restive Darjeeling came in for criticism from other opposition leaders as well. “There is no quick-fix solution for the situation in Darjeeling. But both the state government and Centre are exactly trying to do that,” said CPI(M) politburo member Biman Bose. “Both Binay Tamang and Bimal Gurung are wanted by police. But since Tamang has sided with the chief minister, police is no longer taking any action against him. Bimal Gurung is now the target,” remarked state Congress president Adhir Chowdhury. Life in Darjeeling and other places in the north Bengal hills were normal on Saturday morning, the day after the gun fight took place between Bimal Gurung’s supporters and the police. Vehicles were on the roads, markets were open for business and tourists were seen sightseeing. The BJP state president also alleged that sub inspector Amitava Malik was killed as he was not adequately trained to deal such combat situation in such terrain. “He speaks without any basis. Even a child will laugh,” retorted Deb. Ghosh was mobbed allegedly by the supporters of Binay Tamang faction of the GJM during his recent visit to Darjeeling.